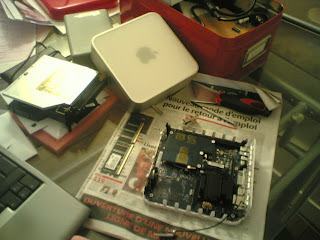 In what die-hard Macbashers would claim is the first genuinely constructive use of Apple hardware in year, French bloggers at www.w3sh.com have posted an innovative mod they call the iToilet. 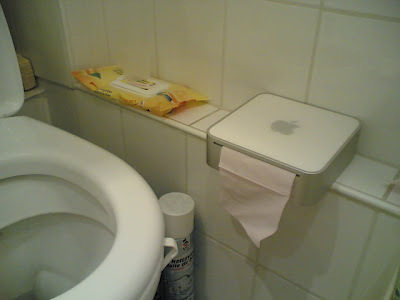 Taking full advantage of the Mac Mini's compact dimensions and white exterior, they modded the diminutive OSX box into a toilet paper dispenser. The project is bound to get a rise out of Apple fans and new converts alike, many of whom are part of the growing group of people enchanted by Cupertino's design ethic: attracted to the brand by the venerable iPod range, they reportedly have been buying Mac Mini's in order to have something to plug their iPods into and use iTunes. 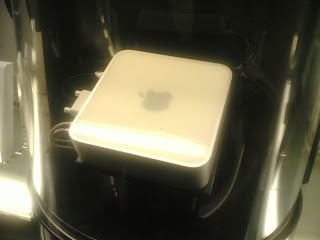 Having been bitten by the bug, they then get an iBook or Powerbook to take travelling, an Mini iPod for jogging since their 30Gb iPod is too big, and maybe even a G5 desktop system to replace their PC. Considering just how flush (sic) with cash these people seem to be, this project should be right up their street! Step 1: Find yourself a Mac Mini. Step 2: Open it up and remove innards. 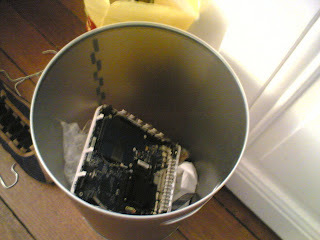 Step 3: Throw the unwanted parts in the bin. Step 4: Load with Charmin Ultra and replace cover. Of course, you could happily install a wad of Kleenex and use it as a tissue dispenser: it might come in handy for when Apple announce their new dual-core Intel Pentium M Powerbooks. Posted by laura at 11:16 p.m.